VH Audio is pleased to announce the new SYMMETRY balanced XLR analog cables, as part of the Gold Label series of VH Audio cable products. Natural, unbleached cotton and VH Audio's AirLok dielectric are used as the signal and return/ground dielectrics for the Symmetry Ag. The AirLok™ dielectric is VH Audio's proprietary form of foamed/cellular Fluoropolymer that achieves a dielectric coefficient of 1.4. By comparison, the dielectric constant of solid fluoropolymers, such as DuPont PTFE, FEP, and, PFA (referred to as Teflon®, when licensed from DuPont) is 2.1. A perfect vacuum is 1.0. The unbleached cotton acts as a mechanical vibration dampener. The result is faster transient response, better overall coherence, and increased resolution, without being 'bright', sterile, or analytical. For the Symmetry Cu, solid FEP is used for the dielectric to maintain a stable, consistent 110 ohm impedance. PTFE film is wrapped at a precise tension around the internal core of the cable to further limit relative movement of the internal conductors. A thick state-of-the-art vibration dampening compound is extruded around the core at high pressure, creating a thick buffer between the signal and ground/return conductors and the next layer. The next layer is a foil and a silver plated copper braid made of extremely fine individual conductors. This double shielding is spaced AWAY from the internal signal conductors, thereby minimizing interactions with the audio signal wires. Another layer of the vibration dampening compound is applied at high pressure over the shield for mechanical vibration dampening, while still maintaining a very good degree of flexibility. 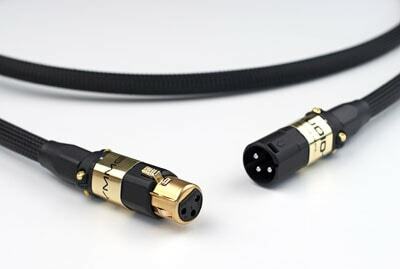 Balanced interconnects are terminated with Furutech Rhodium plated OCC copper XLR plugs for Ag and Furutech Gold plated XLR's for the Cu version. The entire cable is 'conditioned' after final assembly on a purpose-built 'cable cooker'. This means much quicker ramp-up to maximum performance in your system. Finished cables are made with the best components available worldwide, and are handcrafted in the USA by VH Audio.